Another recipe from Veganomicon. I can take or leave quinoa but I know I should eat more of it, so when I was wondering what to make for lunch I thought of this. I made the full amount from the book and it’ll serve me 3 lunches. It looks so pretty! All it is is quinoa, mango, black beans, spring onion, red pepper, coriander, and a mixture of red wine vinegar and oil. Really tasty, pretty and healthy too. This entry was posted in Uncategorized, Veganomicon by efcliz. Bookmark the permalink. oh wow, that salad has been right at the top of my must-try veganomicon recipes and it’s even prettier than I imagined! I’m so trying this soon! 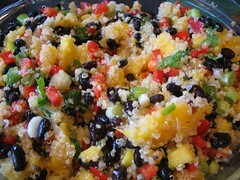 Pingback: Quinoa, black beans, and mango: the perfect potluck combo « Bali What?